Lyttelton Port is working with ecologists to protect penguins as construction begins on the new cruise berth. Ecologist Annabelle Coates gets down on her hands and knees at the western end of Cashin Quay shining a torch into holes in the rocky shore. She looks for the distinctive white splat of a little white flippered penguin. 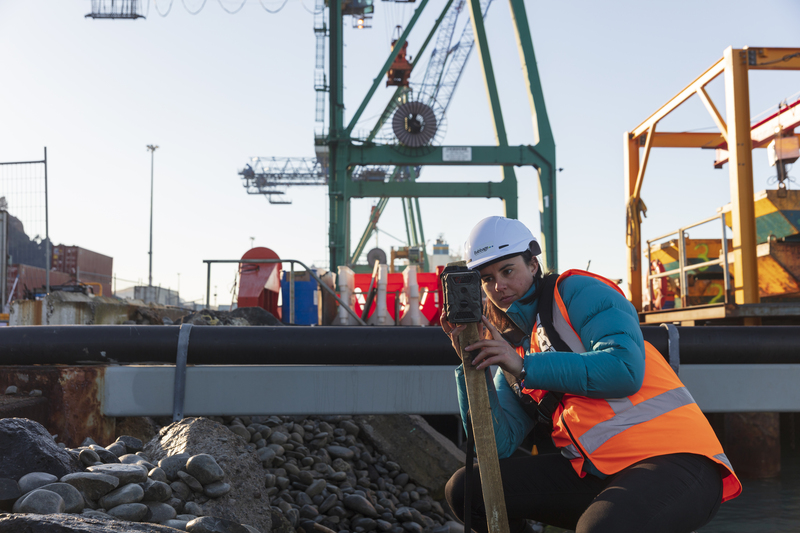 Annabelle was called out to hunt for penguins before construction begins on the new cruise berth at Lyttelton Port She’s not expecting to find any so close to the busy Container Terminal, amidst a steady stream of humans, cranes and flashing lights. But she has to be sure, so a series of infrared cameras are installed along the seawall. Some take photos every 10 seconds. Others are motion activated. A few days later, Annabelle collects the cameras and begins the task of reviewing thousands of photos. “When you scroll through them quickly, it’s kind of like watching a movie so any change is really obvious,” she says. At 1.26am, a penguin appears. He (most likely a male out scouting for a spot to nest) moves in and out of frame, looks directly at the camera, and then disappears. human influenced area,” Annabelle says. The covert surveillance has worked and Annabelle heads back to the Port to try and track the night-time visitor. She looks for his tell-tale signs and peers into nearby holes but finds nothing. “From July some penguins are starting to think about nesting. The males usually find a nesting site and get it all ready and then try to attract a female. So it was likely to be a male just scouting around for a nesting site,” Annabelle says. The little white flippered penguin is a little penguin (sometimes known as little blue penguin or, in Australia, fairy penguin) with a distinctive white stripe on the top of its wing. Although the white flippered penguins are found only on Banks Peninsula scientists believe they are not genetically different to little penguins. “It’s kind of like how you get black fantails and grey fantails but they are the same species,” Annabelle explains. Little penguins are aptly named – they are the world’s smallest penguin. The breeding season goes from August to February. “Plus or minus a month,” Annabelle says. Eggs are generally laid between July and November. Eggs take around 37 days to hatch and chicks leave the nest at about 55 days old. Little penguins are listed as “at risk – declining”. Annabelle says this is because of predators and loss of habitat. To help out penguin breeding boxes have been installed on nearby Quail Island. Around the Port penguins have been known to nest in the seawalls from the Inner Harbour to near the LPC coal yard. LPC is helping these birds by controlling predators such as rats and possums in the area and surveying the nests to keep the birds safe. Little white flippered penguins are also known to nest near the shoreline around Naval Point, where their greatest threat is dogs being walked off-lead. 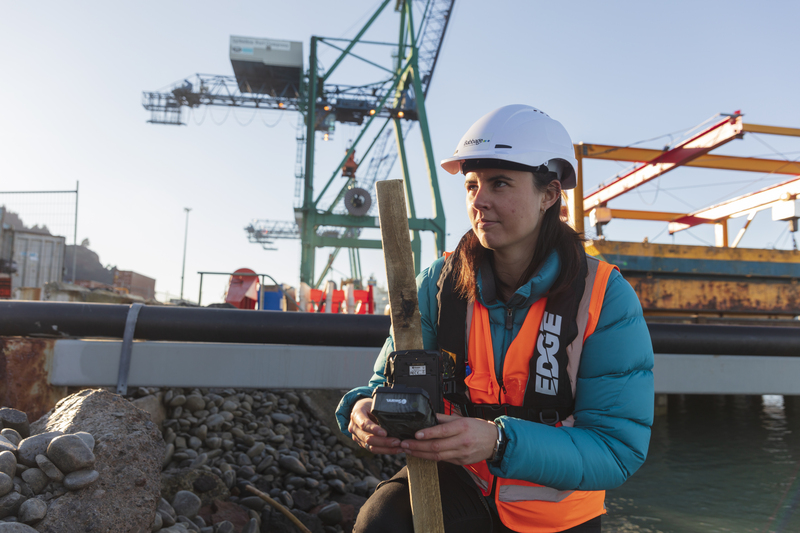 A 2017 penguin survey by LPC estimated there are about 55 penguins using habitat within the Port operations area. A Banks Peninsula wide survey in the early 2000s showed there were approximately 5900 little penguins living in the peninsula’s harbours and outer bays. LPC has a permit from the Department of Conservation to handle penguins if they need to in order to keep them safe. Once Annabelle declares the cruise berth site to be free of penguins, the rocky holes at that site are filled in to prevent any nesting in the construction zone to keep the birds safe. “There’s plenty of nearby seawalls that provide good habitat and LPC surveys the area so we know where the nests are and can protect them, and this gives the birds a good chance of successfully raising chicks,” Kim says.